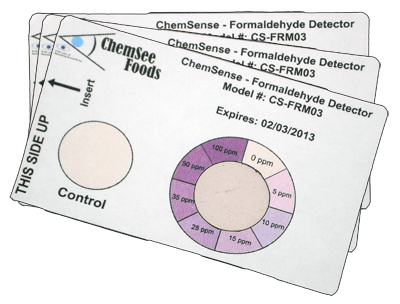 PRODUCT ALERT: Detection Kits are now avaliable for Nitrite, Nitrate and Formaldehyde in Milk products. Quantitative Readings are avaliable by incorporation of the EYAL™ DD-04L Quantitative Reading System. For more information and pricing, please contact us. Detection is avalaible quantitatively via the QuantTabs™ Determination Tabs used in conjunction with the EYAL™ Quantitative Reader. 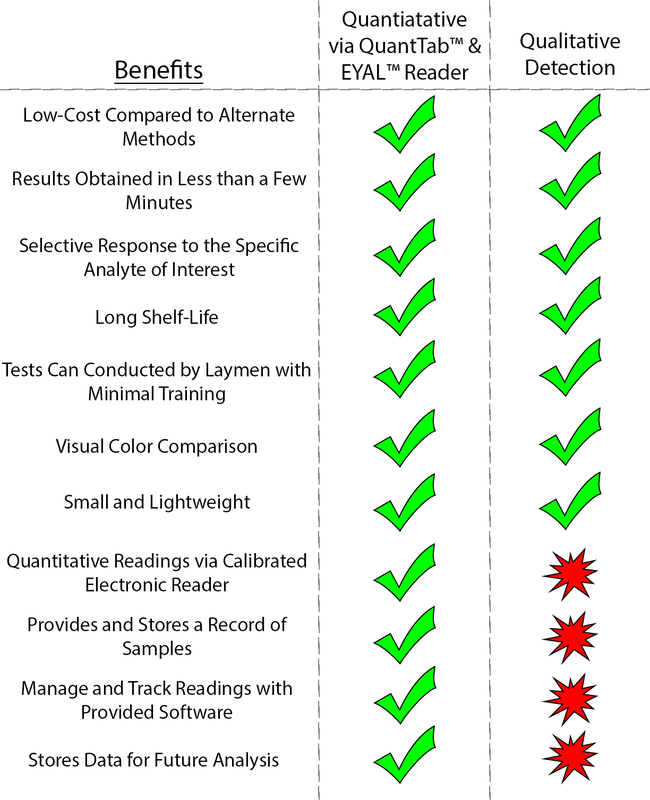 Also, qualitative detectors are avaliable for low-cost screening and testing via rapid visual analysis test strips. Inorganic nitrogen compounds, mainly nitrates and nitrites. The distribution of inorganic nitrogen compounds is dynamic: i. e. nitrates may be converted to nitrites and nitrites may react with amines or thiol groups in the milk organic matrix to form N-nitroso or S-nitroso groups. Nitroso groups are known cancer causing moieties. Food manufacturers are urged to reduce or eliminate the amounts of nitroso groups in foods. Quantitative Detection can be done via the QT-NI02 QuantTab™ Determination Tabs for Nitrites in conjunction with the EYAL™ Reader. More information on the EYAL™ Quantitative System can be found here. The QT-NI02 QuantTabs™ are capable of detecting as low as 100 parts per billion of Nitrites in milk and other dairy products. Qualitative visual detection can easily be done by conducting low-cost visual dip-stick testing. These detectors can be used as a low-cost method to screen samples. If a sample is positive, a user can then decide to quantitate the reading or not, thus saving time and money in a quality assurance process. In a recent study, the measured nitrate concentration in milk ranged to be from 0.3 to 417.7 ppm with an average concentration of 92.7 ppm. Nitrates occur natrually in the soil, water and food that cows consume and pass to the excreted milk. Once the Nitrates enter our system they can be then converted into nitrites in our saliva and digestional trac. Once in the acidic conditions of the stomach, Nitrites can react with other amines to create Nitrosoamines which are cancerous compounds. Nitrosoamines are compounds that are similar to what are found in many cigarettes and other tabacco products. Quantitative Detection can be done via the QT-NI03 QuantTab™ Determination Tabs for Nitrates in conjunction with the EYAL™ Reader. More information on the EYAL™ Quantitative System can be found here. The QT-NI03 QuantTabs™ are capable of detecting as low as 2 parts per million of Nitrates in milk and other dairy products such as whey protein and other dried powders. Formaldehyde is a toxic material that can kill bacteria and viruses as well as damage human cells. Manufacturers sometimes add Formaldehyde to milk to extend its shelf-life. Although adding formaldehyde to foods is forbidden in many countries, some manufacturers still add it. Consumers of milk should know if these products contain excessive and dangerous amounts of formaldehyde. Inspectors of food need to know if formaldehyde was added purposely and illegally to the food. Excess exposure to formaldehyde is known to increase the possibilty of cancer and also cause breathing difficulties. Women in the early stages of pregnancy are also highly sucectible to exposure to Formaldehyde, as it is suspected to cause birth defects and other complications with early child development. Quantitative Detection can be done via the QT-FRM03 QuantTab™ Determination Tabs for Formaldehyde in conjunction with the EYAL™ Reader. More information on the EYAL™ Quantitative System can be found here. The QT-FRM03 QuantTabs™ are capable of detecting as low as 2 parts per million of Formaldehye in milk and other dairy products such as whey protein and other dried powders. Qualitative visual detection can easily be done by conducting low-cost visual dip-stick testing. These detectors can be used as a low-cost method to screen samples. If a sample is positive, a user can then decide to quantitate the reading or not, thus saving time and money in a quality assurance process. More information about this product can be found at by clicking here..